For the price, you might consider the knife a bargain anyway. The Pathfinder is nearly 13 inches of full tang 420 high carbon stainless steel knife with an armor-piercing tanto point and a partially serrated edge. The aluminum handle slabs bolted to the tang contain rubberized inserts, which are intended to make the grip more firm and more comfortable. The dropped bolster forms a deep finger choil, and along with the dropped heel of the knife does provide a solid hold on this wicked-looking blade. Some of the promises implied in a tactical knife aren't fulfilled -- the steel isn't the best quality, and the bayonet mounting slot won't be useful to many owners. The rubber pads in the grip are nearly as hard as the aluminum. Another weakness is the nylon sheath, with compression buckle straps that release much too easily to depend upon. The Pathfinder is still plenty of knife for the price but isn't the best design for field use. The compass is an old style that works, with the same advanced features as standard issue field compasses used in WWII. I can actually recommend this type as a good way to learn wayfinding -- once you know this system, all the rest of it is easy. 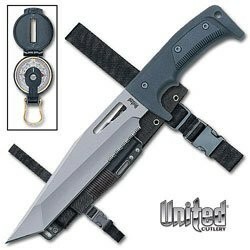 United Cutlery makes a popular survival knife of similar quality -- check out the Bushmaster with its concealed packet of emergency gear.